We ran two free, open sourced database benchmarks for this portion of the analysis. The first uses MySQLd 4.0.20d installed from x86_64 RPM; precompiled by the SuSE team. We ran the test-select and test-insert sql-bench exams. 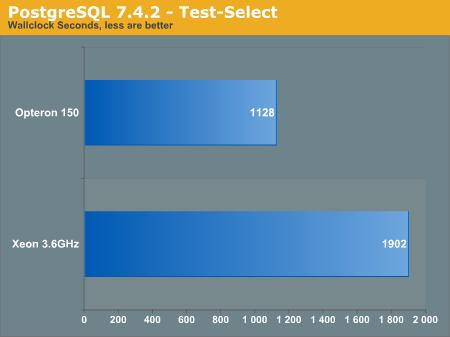 Adding Postgres to the SQL benchmarks was fairly easy. Although this may not be the most optimized way to benchmark Postgres, our time was limited. We installed the DBD-pg Perl library, and then reran our sql-bench results as above in the MySQL tests Postgres was started with the "-o - F" flags. Remember, even though times are significantly longer in this benchmark, they do not show whether or not one database is faster than the other. However, there are some extreme conclusions we can draw from this test. The Opteron 150 really advances over the Xeon processor in this benchmark. We have shown in previous reviews that HyperThreading seems to hurt MySQL performance as some unnecessary threading probably occurs. Great review! I wish someone would benchmark AMD 64 and EM64T in 64 bit mode with MORE THAN 4 Gigs of RAM. I heard EM64T takes a hit with more than 4 gigs. This was a great followup article, and certainly cleared a lot of things up. I was just wondering if its possible to use the SPEC benchmarks in addition to the ones you've used, so we can get the SPECint & SPECfp values to go with it. There are some published values for these on the spec website, but the setups for each of those published results are not the same, so its difficult to put them in perspective. Since you ususally have access to very similar setups, I was wondering if you could add those two tests to your set of benchmarks. Thanks! Kris - "To be honest i wouldnt have known some of the mistakes i made had people not been so critical. I am not upset with the final outcome, it happens to everyone"
1. 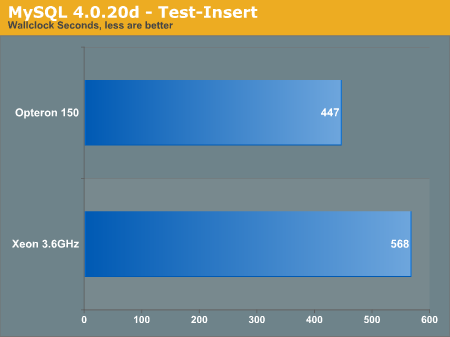 Most benchmarks ran a lot faster without hyperthreading, a scenario that was not tested here. i just wanted to say im a long time anandtech reader and I appluade the work done wiht this review to clear up the problems with the previous one. it takes some guts to come out and admit things were done badly and I can say I can respect the reviews more knowing you all are willing to admit those things, some sites have a problem with that and work with the readers to solve the problem. i have been a fan of the site for several years and I was very suprised at the first review, but now i see you trying to make up for that and go forward, I just want to thank you for the work done on this review. #55: Had a typo when i moved the table back over to make it readable :) They are both registered C3. I will work on the color issue more in the future, i just picked the default colors this time around. There are new Xeon processors, dubbed Iriwindale, that use 2MB L2 cache. However, the Xeons you see now with large cache are L3. First off, MUCH better.... At least this seemed like a more fair fight. Second, (and this is a personal gripe against most benchmarking sites) either pick a color code for each brand's processor and use that color for ALL charts showing that processor, or always list them in the same order. Showing the "best one first" can be rather confusing when they're changing order from one chart to the next. One other thing... Doesn't the Xeon have more than 1MB L2 cache? I thought the newer ones were all using 2MB or more of that or L3??? Anyhow, thanks for going back and redoing this work. I don't think any of us hates you personally, we just want to see FAIR and EVEN reporting in general across the board. This review has gone a long way towards restoring my faith in this site. Agree with 42 and 52 something wrong with your statement on Blowfish. Also agree with 50 on the power of different optimisations (and its early days for the Nocona). Thanks also for waking up my interest in linux. Now, I don't know if it's just me, but I couldn't bring up the forum popup in firefox, either. Why not?